JAYAPURA, Indonesia - The wreckage of an Indonesian plane carrying 54 people has been found in the Papua region, officials have said. 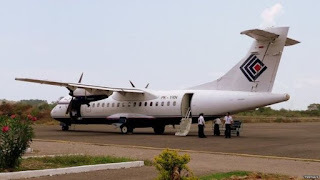 Contact with the domestic flight was lost just before 15:00 local time (06:00 GMT) after take-off from Sentani airport in the regional capital Jayapura. The Trigana Air ATR 42 turboprop was flying to the town of Oksibil in the south of the region with 44 adult passengers, five children and infants, and five crew aboard. The plane took off from Sentani at 14:21 and contact was lost at 14:55, according to air traffic control. Indonesia's transport minister said the aircraft had been found in the Bintang highlands region, not far from its intended landing site at Oksibil airport. "Residents provided information that the aircraft crashed into Tangok mountain," said the country's director-general of air transportation, Suprasetyo. Trigana Air is a notoriously unsafe airliner, its had 14 serious incidents since it began operations in 1991, losing 10 aircraft in the process, according to the Aviation Safety Network. It has been on a European Union blacklist of banned carriers since 2007, reflecting a trend across the Indonesia aviation sector. All but four of the country's certified airlines are on the list. Correspondents say Indonesia has a patchy aviation record overall, with two major crashes in the past year alone. An Indonesia AirAsia plane crashed in the Java Sea last December while on an international flight from Surabaya to Singapore, killing all 192 people on board, most of them Singaporean. In July, a military transport plane crashed in a residential area of Medan, Sumatra, killing more than 140 people, including several on the ground. The ATR 42 makes up the backbone of the Trigana Air fleet, account for 7 of its 22 aircraft, the rest being Boeing 737s and de Havilland Canada DHC-4 Caribou and DHC-6 Otter. JAKARTA, Indonesia - Search and rescue officials will travel to a remote part of Papua, Indonesia on Monday to inspect wreckage of the Trigana Air Service plane which went missing late on Sunday. Villagers told authorities they saw the plane crash into a mountain, some 33 minutes after it had taken off. Indonesia's air transportation director general, Suprasetyo, confirmed the wreckage had been located at a news conference. Suprasetyo was appointed in January this year at the time of the disappearance of an AirAsia flight with 162 people on board. Indonesian President Joko Widodo said at the time the AirAsia crash had exposed widespread problems in the management of air transportation in Indonesia. Meantime the Trigana Air Service ATR 42-300 plane has been located in the Oktabe district of Papua province, Suprasetyo said. Details were still being verified he said, adding no information had been received as to whether there had been any survivors. The Trigano Air flight TGN267 left Sentani Airport in Jayapura at 2:22 p.m. and was scheduled to land in Oksibil at about 3:16pm. The plane lost contact at about 2:55pm., Transportation Ministry spokesman J.A. Barata told CNN Indonesia. It was understood no distress call had been made by the plane before its disappearance. A search-and-rescue operation by the National Search and Rescue Agency (BASARNAS) was initiated but was suspended due to fog and bad weather which made the continuation of the search hazardous. The plane had 54 people on board, comprising 49 passengers, which including five children and infants, and five crew members. With the Trigana Air Service loss, three Asian airlines have now lost a total of 4 planes in the past eighteen month. Malaysian Airlines lost MH370 and MH17, while the AirAsia plane which had departed Surabaya, Indonesia for Singapore in January, crashed in the Java Sea. Trigana Air Service is one of a large number of airlines banned from operating in European airspace due to safety concerns. The ban relating to Trigana has been in place for the past eight years. In the wake of the AirAsia crash in January, Indonesia suspended 61 flights from five airlines which did not hold valid permits for flying from the country. The transport ministry also suspended 11 officials for negligence and carried out audits at five airports. The wreckage of an Indonesian passenger plane with 54 people aboard has been found in the rugged eastern province of Papua. The plane crashed Sunday while flying through bad weather. Villagers in Papua's Bintang district found the wreckage in the mountains, Indonesian transportation ministry said. Officials were still verifying the information from local residents. Indonesian authorities say rescuers have been sent to the remote area and will begin searching there Monday. It was unclear if anyone survived. Trigana Air Flight 267 lost contact with air traffic control about 30 minutes after takeoff Sunday from Sentani airport in the provincial capital, Jayapura. The plane was on what is normally a 50-minute flight to the city of Oksibil. Forty-four adult passengers, five children and five crew members were on the turboprop plane, according to aviation officials. Trigana sent another aircraft to trace the flight path of the missing plane minutes after it failed to land, but Air Operations Director Beni Sumaryanto said nothing was spotted because of bad weather. Trigana operates domestically in Indonesia. It has suffered 14 serious incidents since beginning operations in 1991 and is on a blacklist of carriers banned from European Union airspace. Relatives of passengers on the missing Trigana Air Service flight stand in front of its closed offices at Sentani airport in Jayapura, Papua province, Indonesia, Aug. 16, 2015. The ATR 42-300 twin turboprop that went missing had several safety problems since it began operations more than 20 years ago, according to the Aviation Safety Network. An Indonesian passenger plane with 54 people aboard is missing in the country's easternmost province of Papua. Trigana Air Flight 267 lost contact with air traffic control Sunday about 30 minutes after takeoff from Sentani airport in Papua's capital, Jayapura. The plane was on what is normally a 50-minute flight to the city of Oksibil. Aviation officials say 44 adult passengers, five children and five crew members were on the turboprop plane. Search efforts were called off after dark late Sunday. "We can't confirm it has crashed. We can say contact has been lost with the plane," Bambang Soelystyo, chief of the National Search and Rescue Agency (BASARNAS), told Reuters by phone. The Sentani Air Force Base commander said authorities have mapped out the area around the flight path for when search efforts resume Monday. Much of Papua is covered with impenetrable jungles and mountains. Trigana operates domestically in Indonesia. According to the Aviation Safety Network's online database, Trigana has had 14 serious incidents since it began operations in 1991. Indonesia has had two major crashes in the past year. In December 2014, an AirAsia flight went down in the Java Sea, killing all 162 on board. The government introduced regulations aimed at improving safety after that crash. In July, Indonesia's president promised a review of the aging air force fleet after a military transport plane crashed in the north of the country, killing more than 100 people.